Welcome to Turkey’s most awesome scenery: abounding with intense, technical ups, super fun smooth, flowing chutes and adrenaline fuelled rock garden descents. This is Turkey’s trail biking paradise- a volcanic landscape offering challenging and rewarding slick rock; lush, green singletracks and unforgettable caves, tunnels and canyons. 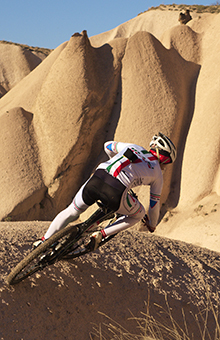 Accessible to all riders with a little off-road experience, the sandy terrain makes Cappadocia a perfect place for beginners, improvers and experts alike. Biking in Cappadocia is so much fun, but what this sets this tour apart is quality of hotel accommodation and restaurants used throughout, complimented by a breadth of historical and cultural interest rarely matched on world class singletrack terrain such as this. 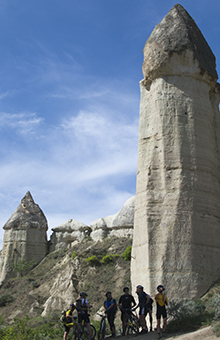 Cappadocia has it all- great trails, friendly, welcoming people and a landscape that will blow your mind…. Situated in the centre of Turkey’s great Anatolian plain, Cappadocia is a legendary land of towering “fairy chimneys”, cave dwellings and dormant volcanoes, laced together with lush, green valleys. Mountain biking in Cappadocia is the perfect balance between unmissable scenery, challenging trails and luxury boutique hotel accommodation. It is a place guaranteed to stir the emotions, and also one of Turkeys best balances of tourism know how and traditional ways. This tour offers a good taste of remote, wilderness biking without losing touch with it’s trail focused roots- it’s a no compromise selection of Turkey’s very best singletrack routes led by expert local riders. Grading is Intermediate with sections of Advanced, although those sections are always easy to pass on foot, and full warning will be given! Off road biking is in its infancy here- so be at once a pioneer of this new terrain and likewise have the trails to yourself. This tour is purely designed around the BEST biking trails the region has to offer- no compromises. You will also enjoy some of the best cave hotels anywhere in Turkey, plus delicious and plentiful meals showcasing the most delicious Turkish food in charming, family run restaurants. Apres-bike is simple but fun, and accommodating to the tastes of the group- don’t expect night clubs and discos, but we can enjoy a few beers over (and after) dinner. Hotels are excellent- and you will love the chance to stay in genuine cave rooms! We have been based in Goreme, the jewel in Cappadocia’s crown, for the last 10 years, and know the region’s trails like the backs of our hands. There can be few better places to ride a mountain bike on this earth. So many trails and so much variety this is a single track paradise. Cappadocia enjoys a continental climate of long, dry summers and cold winters, often with heavy snow. The best time to ride is May – June and September – October though the itineraries we offer are broadly possible right through from April to November. In spring the landscape is much greener, and often covered in swathes of wild flowers. Late summer can get very dusty until the first rains come (normally not until October). Fly to Kayseri from Istanbul, with connecting flights worldwide. Turkish Airlines have really good deals if you book in advance. We are authorised agents and can book your tickets for you- please ask! Bring you bike along or hire one of ours. We currently good bikes that really make the most of the steep, sandy and technical trails we have here. The remains of the millions years ago volcanic eruptions, shaped by the wind and rain for thousands of years, have formed one of natures most spectacular masterpieces: Strange rock formations, called: “fairy chimneys”. Settled throughout time by Hittite, Persian, Romans, Byzantine and Ottoman civilisations, many of these caves are still decorated with icons and wall paintings from the early Christian times. Cappadocia is rich with history and filled with natural wonders! 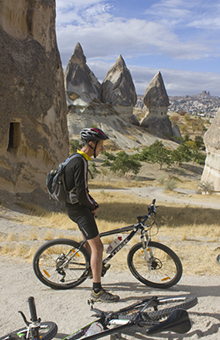 Click here for the latest detailed itinerary Sunset Singletrack Cappadocia from Biking in Turkey on Vimeo. For groups of less than 6 surcharge of 100 Euros per person is added to the price. 7 nights boutique hotel accommodation. Transfers to and from Kayseri airport. Professional MTB guide. Full use of support vehicle. All meals in best quality restaurants, all snacks and tea and coffee at mealtimes. Flights. Alcoholic and soft drinks available at camps or restaurants and entrance fees to historical sites and museums. Drinks and extras at optional cafe stops. Tips for guides and driver. 4: Some singletrack experience is essential although the tour is suitable for intermediate and improving riders. This is a strenuos programme with technical sections so good cycle fitness and an adventurous attitude are essential! 6 days multi centre trail MTB. Tubeless tyres or some form of slime based puncture protection are strongly recommended for this tour, especially if you choose to ride in autumn. Wide, high volume tyres work best. Low gears are essential. Rubber soled cycling shoes are recommended for hike-a-bike sections. Bring warm, waterproof biking clothing just in case. Hot Air Balloon: 175 Euro. My wife and I ride a tandem Lapierre 2016 mountain bike. We are still going to be on a long term honeymoon in April (due to uk visa regulations) and a pretty skint. We can’t afford to pay for an organised tour but would like to buy your routes so we could cycle alone. Is that possible please? Thank you for the message. I’d like to take advantage of some of your daily tours, It will be just me and I have my own bike. What is the price per day please? I’d like mixed terrain if possible, rocks and roots, single track etc. What dates do you have available in June and what is the best port to come from? I will be coming from Crete, Kos or Rhodes? I am flexible so I could travel from any island to a degree. That sounds good Jon. Would you know if they allow bikes on the train? Hi Barry, Yes, as far as I know you can take your bikes on a train. Not sure about a tandem though!! Just arrived in goreme. Do you have a bike available of 21,5 inch or similar for this weekend? Could ride alone or in group. Hi Denis, We do have a 21.5 inch Trek Elite 8.5 hardtail MTB available to hire immediately. The price is 30 Euros per day, including helmet, pump and spares kit. Hey guys! my friend and i want to rent 2 mountainbikes from 16th to 20th of may 2015. is this possible to get 2? which types of bikes do you offer ( for single trails)? we will stay in Göreme. thanks a lot for your answer! thanks for your answer and information. It sounds really fine. My friend and I will be traveling to Cappadocia 9/12-9/15. I was wondering if there were mtn bikes for us to rent for either half day or full day to explore the area on our own or with a guide. It would be great to be able to bike a little further out to see some of the off the beaten paths sights, not too technical just want to keep it relaxed. Please let me know if this is available. Thanks so much. Kevin. Hi Kevin, We do have a good selection of bikes available to rent during those dates currently. We can also offer you a bespoke guided tour, which will make the most of your time here! Prices are 30 EUros per day for bike hire only (half day not available), and 90 Euros per person for a full day guided tour, including bike and helmet hire and a good restaurant lunch. Our bikes are good quality hardtails from Specialized and Trek. If you have any questions, or would like to book, please drop me a line at jon@bikinginturkey.com. Thanks! My husband and I will be travelling in Cappadocia Sept 9-12. I would like to book a ride for him (not me :-)). He is an advanced rider from Northern California and has ridden in Whistler, Canada and Colorado as well as all over the bay area. He is much more of a downhill guy than a cross country rider. Wondering if you do an early morning or evening ride (like on the video) and the details. Not interested in an 8 day trip, just looking for a day or partial day trip. What kind of bikes do you offer. Hi Lita, Currently we do still have good availability between September 9th and 12th so you might be in luck! Your husband will love the trails here!!! If he is more into downhill, this is ideal- we can offer uplifts to the top of the trail heads so it will be non-stop fun all the way… The cost will depend on how many hours your husband would like to ride with us- let me know. We have good quality hardtail bikes from Specialized and Trek- to be honest as the trails are steep, twisty and smooth here, a full suspension bike isn’t really needed. Drop me a line at jon@bikinginturkey.com for more info, or to book. All the best. My husband and I are interested in a 5-8 day bike tour in Cappadocia for our honeymoon – can you give us more information on the self-guided tours? Hi Lydia, Certainly, it will be our pleasure to advise! 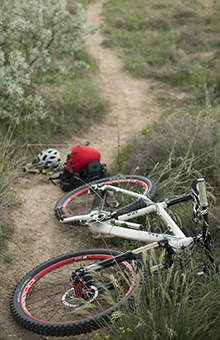 The singletrack tours aren’t normally offered as self-guided due to the nature of navigating the trails here. However, if you are competent, we can suggest great routes and supply you with maps and GPS files. Still, guided tours are the best for technical singletrack, and for self-guided we recommend easier terrain such as in our Cappadocia Adventure Biking tour. I’ll send you a mail with some options anyhow. Thanks! Hi Lokman. Yes- we can help you! Expect an email soon with full details of options, costs etc! I am intereseted in this tour. I am from Russia (Northern Caucasus region) and have been thinking of an opportunity to ride around Cappadocia for quite a while. Could you please specify dates of this tour? Could it be a problem if I am the only one participant or maybe I could join some other group? We are 2 spanish guys really interested in renting bikes for MTB tours from 11 – 14 June (2 or 3 days). Could we rent quality bikes? What should we wear from here? How much does it cost? Is it possible to hire a guided tour as well? Do you have mountain bikes available to rent from 24-27 May? I’m flying into Kayseri airport on the morning of the 24th, and was looking to do some advanced mountain biking day trips around the Goreme area. Other than flights I haven’t booked anything else yet, so could use some recommendatiosn for hotels and other local attractions, e.g. hot air balloon ride. Thanks! Hi Brandon, we have good quality hardtail MTB’s available during those dates- plus plenty of info and ideas on routes, things to do etc. I’ll send you an email with info, options, prices etc. Thanks! Bonjour, nous sommes un groupe de 4 ou 6 personnes et souhaiterions venir faire le “cappadoce single track”, mais nous ne disposons que de 6 jours du 26 avril 2014 au 3 mai 2014. Serait-il possible de nous faire une proposition de tarifs. I’ll be in Cappadocia on 21st and 22nd March, is it possible to do a full days guided singletrack riding, including bike hire? Hi, we will be in Turkey in May and would love to do a day of mtn biking in Cappadocia. We are at different skill levels (my husband is soooo much better than I am). Do you have anything that could accommodate both of us? We would need to rent bikes and equip. Please send an email with info/prices. Thanks!! Hi Chantale! Yes, we have great trails here that are accessible for all abilities but also challenging for the best riders! I’ll send you an email with some details- thanks for getting in touch! I am hoping to arrange a few days of biking in Cappodocia in mid September. We would want to hire two bikes and someone to transport our bags but we don’t mind if it is guided or not. Is this something you would be able to help us with? Or do you know of a similar company that could? Hi Karina. Yes- we are the leading company offering assisted MTB tours (with baggage transfers) in Cappadocia- you have come to the right place! We have guided and self guided options- I’ll send you an email with some details. Many thanks. was wondering.is there a package for two days trail biking in cappadocia? and can i rent a full suspension all moutain bike? Please send me an email as well about dates and whatever you think is useful to know about a trip in early May 2013. Me and four other guys went on the UCPA’s Objectif Méditerranée this summer and I think we’ll be just as many wanting to go on a similar trip next year. I’m interested in MTB in Turkey in September or October. I’ve a 1/2 Ironman either 23rd or 30th Sept. Very nice looking scenery. I’m a vegan but I’ve heard Turkey is quite accomodating.